Party Frosting: Shopping Saturday... finish tomorrow! I am not sure about you guys but OMG what was going on with the traffic today?! is it back-to-school mania?! We spent hours fighting traffic up North while shopping for work clothes and didn't get much of our normal stopping ground covered... so I'll be back with full inspiration tomorrow when I can hit up my craft shops! Here is one thing we did buy today! 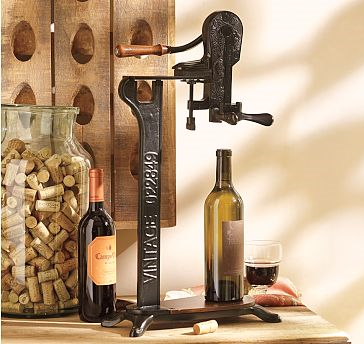 ...if you follow my personal stuff, you know we heart wine - we feel in love with this vintage inspired stand wine opener at Pottery Barn and splurged on it! ... cya tomorrow for party shopping Saturday stuff!